Onze excuses, er lijkt een fout te zijn opgetreden. Probeer het opnieuw. MegaOmega is a blend of cold pressed Essential Fatty Acids (EFAs) sourced from Flax, Hemp, Pumpkin, Olive and Evening Primrose Oils. 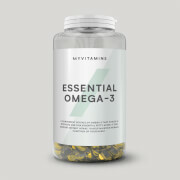 These high quality sources provide high levels of the essential fatty acids Omega 3, 6 & 9. 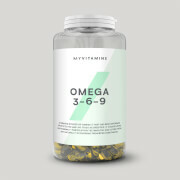 Omega 3, 6 & 9 are important for overall health and wellbeing whilst specifically supporting the maintenance of normal heart, brain and joint function. Essential Fatty Acids (EFAs) are necessary fats that humans cannot synthesize, and must be obtained through diet. They support the cardiovascular, reproductive, immune, and nervous systems and are required to manufacture and repair cell membranes, enabling cells to obtain optimum nutrition whilst helping to remove harmful waste products. EFA deficiency is a common problem throughout society due to poor diet choices meaning MegaOmega is the ideal supplement for those whose diet lacks Omega oils. Studies also show that essential fatty acids can reduce the risk of heart disease, calm inflammation and boost your metabolic rate. Another recent study suggested essential fatty acids can direct glucose (from digested carbohydrates) towards glycogen storage while at the same time directing other fatty acids in the body away from triglyceride synthesis (fat storage) and towards fatty acid oxidation. In simple terms, essential fatty acids appear to conserve carbohydrates for energy while simultaneously burning fat. Hou er alsjeblieft rekening mee dat de etikettering op dit product in het Engels is. Daarnaast kunnen Frans, Italiaans, Duits, Spaans, Deens, Zweeds en Fins ook inbegrepen zijn op bepaalde labels. Consumeer 5ml (1 theelepel) 1 - 3 maal daags bij de maaltijden. Lijnzaadolie, Hennepolie, Pompoenolie, Olijfolie, Teunisbloemolie. Je aanbieding is geldig tot en met 30/04/2019 omstreeks middernacht of zolang de voorraad strekt. Slechts 1 kortingscode per bestelling. Klanten kunnen meerdere bestellingen plaatsen. Minimale besteding voor korting bedraagt €10. Er zijn op dit moment geen recensies beschikbaar.